Caller: Is your refrigerator running? Caller: You better catch it! That is probably THE lamest prank call ever conceived! :). Had that call come to us over the past couple of days, the joke would have been spoiled…just like our ice cream! Our trusty Norcold slowly got warmer, and it seemed to coincide with the outside temperatures getting much colder. Our readings in Grand Rapids dropped to near zero, and the wind chill was 10 to 20 below. A quick surf of the web revealed the problem. 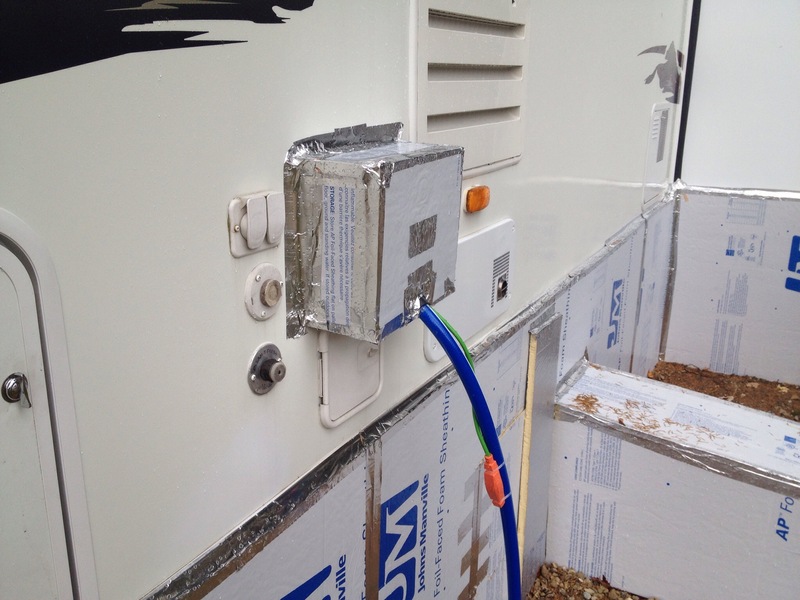 RV refrigerators remove the warmth within them by actually heating the refrigerant in the lines. The actual process is lost on me, but I did understand when it said the coolant actually turns to gel in extremely cold temperatures. 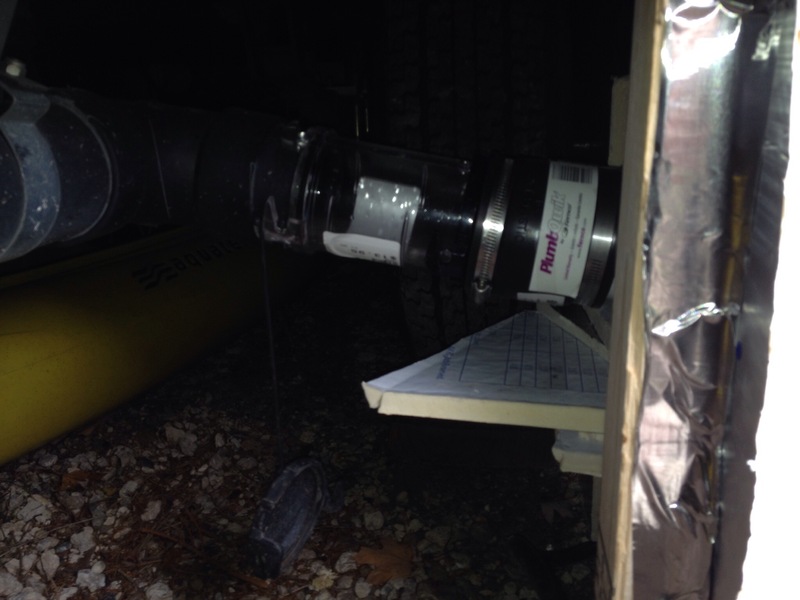 This occurs in the compartment that is vented to the outside of the rig. So Job #1 was to get some heat in there to liquefy the coolant. I followed a few suggestions on the web, as shown below. 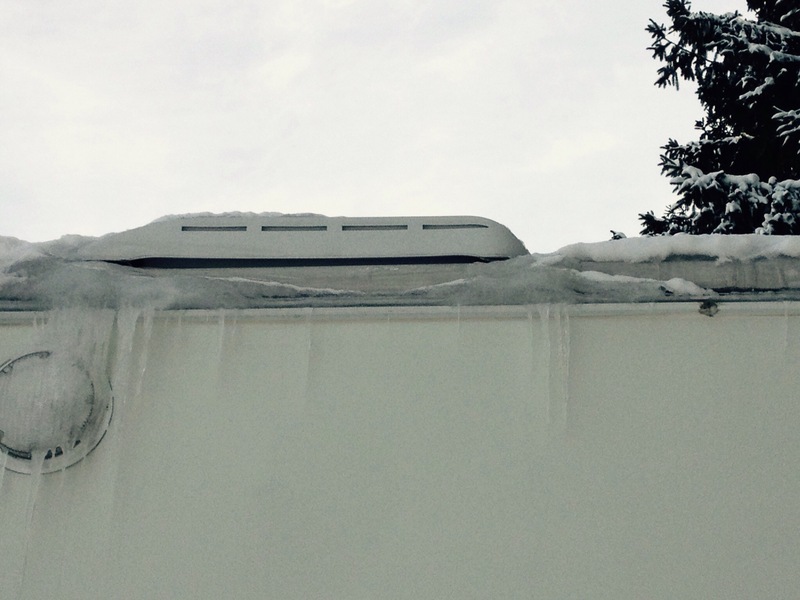 First thing I did was to make sure the vent on the roof wasn’t blocked with snow. While there was ice in the vicinity of it, the actual vent was clear. Next was to tape over the top two slots on the outside vent. This will need to be removed in the spring when we get above freezing, but it is OK for now. 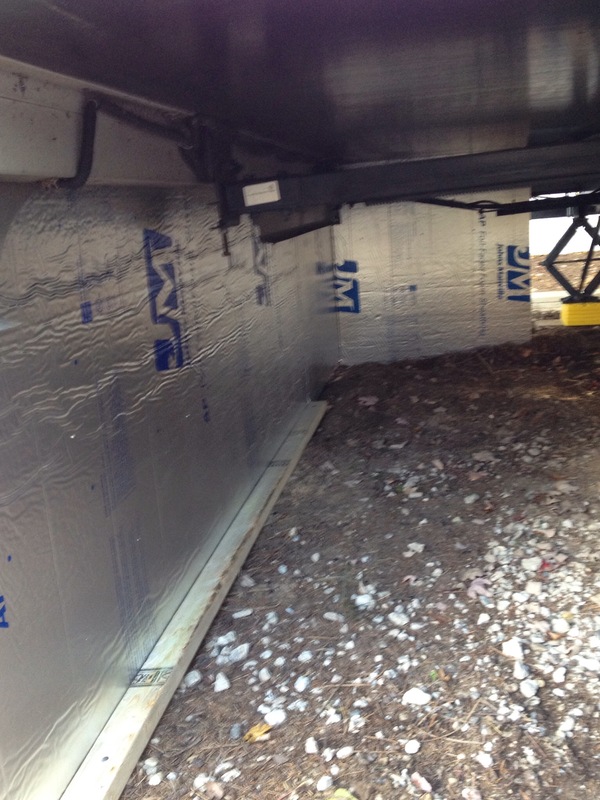 This allows some of the heat to be held in, yet still allows some ventilation. 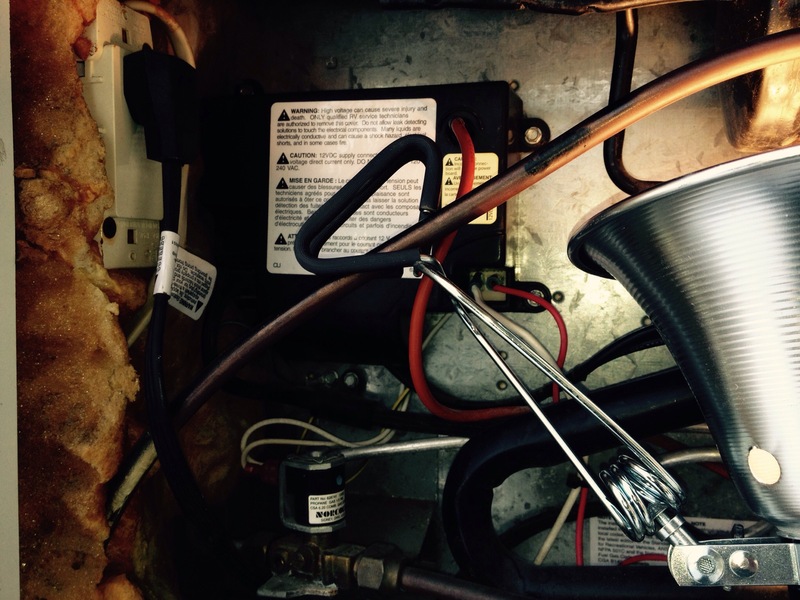 The last addition was a heat source; in this case, a clip on shop light. I used a 60 watt bulb in it, and was careful to not have the aluminum shroud rest against anything combustible. That was left on overnight to warm up the coolant, and will be used throughout the rest of this winter. Fortunately for us, we were able to put the items we could salvage into coolers on our deck. The outside temps were such that no ice was required! The next portion is a heads up to anyone who might encounter this same issue. 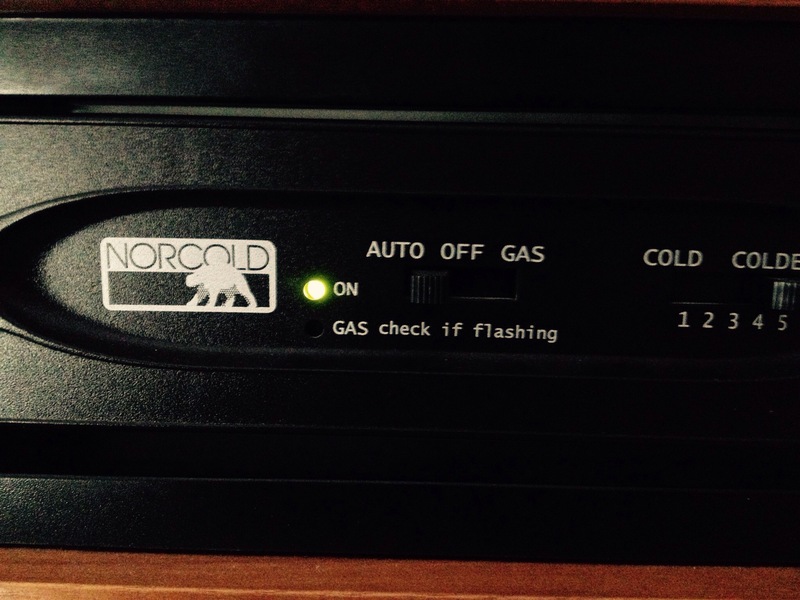 When the unit initially stopped working, there was an error code presented on the control panel. We had the green light blinking 5 times in rapid succession. This was definitely a case of “when all else fails, read the instructions”. Instead of getting the manual out, I turned off the fridge, then turned it back on. Still blinking. That simple act of turning it back on resulted in a LOT of extra work. If this happens to you, turn off the refrigerator and read the owners manual. Do NOT turn it back on. As the coolant had not yet liquefied, the problem still existed. Upon researching the issue, I found out that I not only needed to warm the refrigerant up, I now also needed to reset the circuit board, as two successive trouble codes result in a reset. The black box with the warnings plastered all over it holds the board. To access it, wires need to be unplugged…in a certain order. Once the cover is off, the sequence needs to be reversed. The instructions online then call for a jumper wire to be used between the “open pin to the right of the violet/white wire on the 16 pin plug and a ground, and hold for 15 seconds until you hear a clicking sound and the burner ignites.” Well, first off, there was a 10 pin plug and a 6 pin plug…not a 16 pin plug. 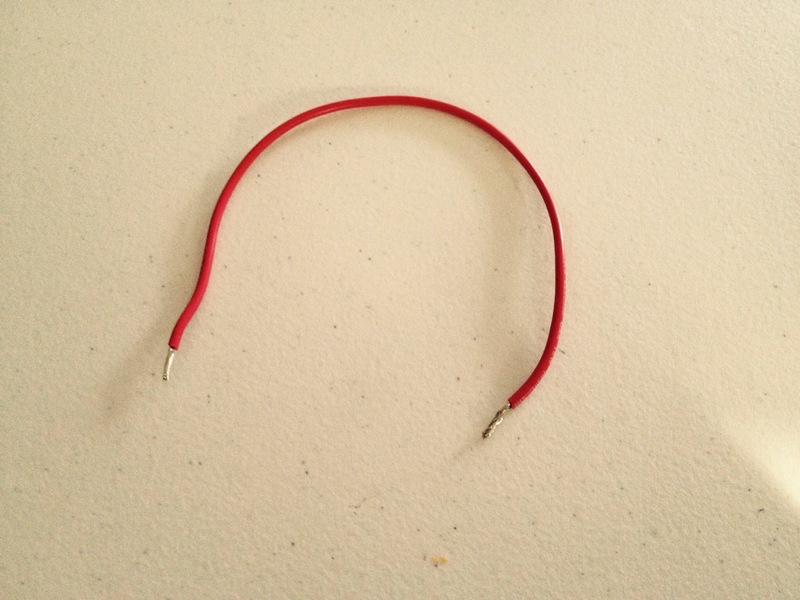 The open pin was to the left of the violet/white wire…and that was not the only open pin. Is this starting to sound like an adventure movie? I took a chance and used the jumper from the open pin next to violet/white to a ground. “Click…whoosh!” Success! I then had to reverse the process of taking the cover off to put the cover back on. It was a lot easier to do, knowing that the fridge was working again! Today’s temperatures are right around 30 degrees, which made the project a little easier. 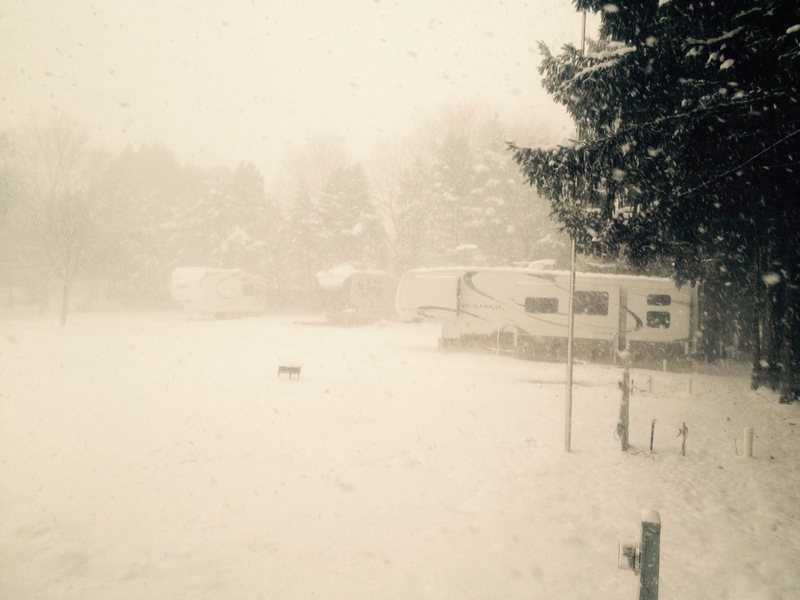 We received a foot of snow since our last post, and the campground looks really pretty. 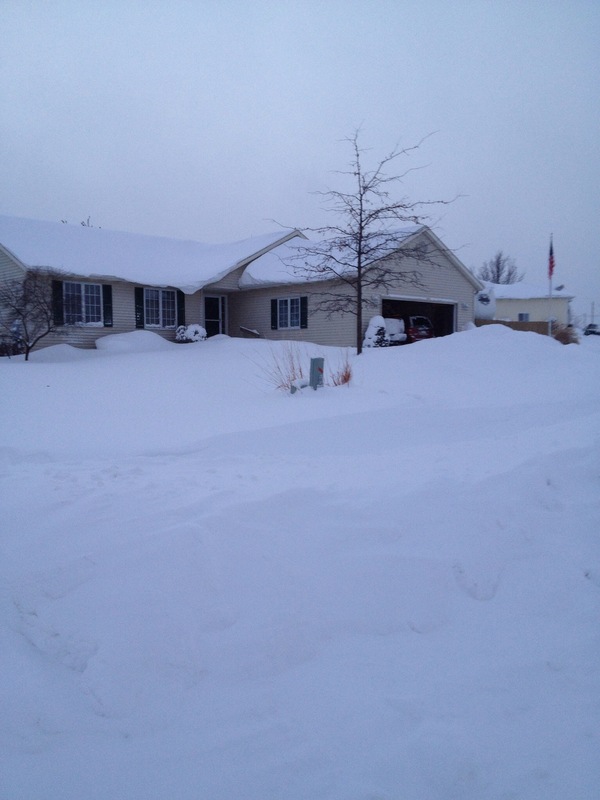 So far, winter has been a lot easier than last year, even though we are 14″ above the snowfall average for this date. Above is a photo of our house last February. 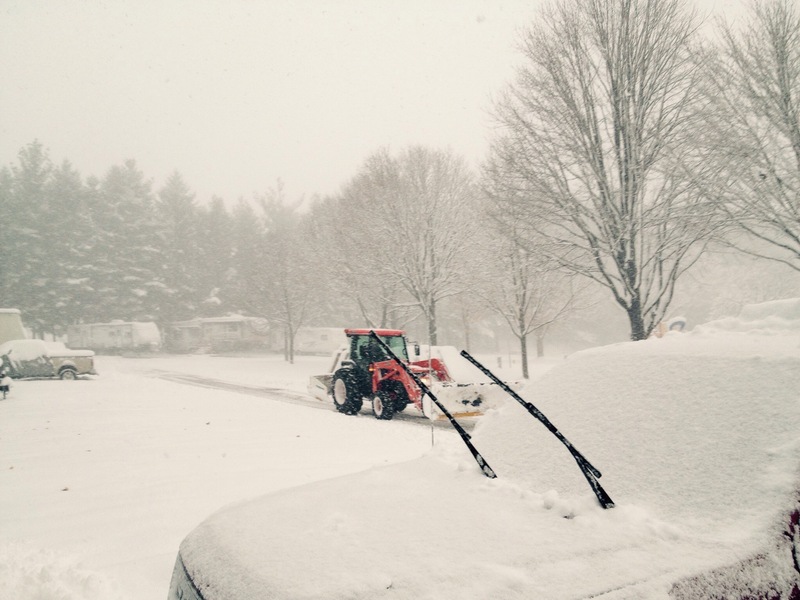 Grand Rapids had 111″ of snow for the season last year, and Holland (25 miles southwest of us) had 152″…and since we never had a mid-winter thaw, most of it stuck around for the duration. So far, we are at 50.7″, most of which melted during the December thaw. There is a lot of winter left, though! Amazon, the Amazon logo, AmazonSupply, and the AmazonSupply logo are trademarks of Amazon. com, Inc. or its affiliates. exploRVistas is a participant in the Amazon Services LLC Associates Program, an affiliate advertising program designed to provide a means for sites to earn advertising fees by advertising and linking to amazon. com. Today was a special day in so many ways. Sure, it had it’s challenges (as so many days do), but it was one that will stand out and sustain us through the remainder of the winter. Take a look at that sky and that snow! That is the kind of powder that crunches under your feet. Outside temperature at noon was a balmy 7 degrees, and the wind chill was well below that. 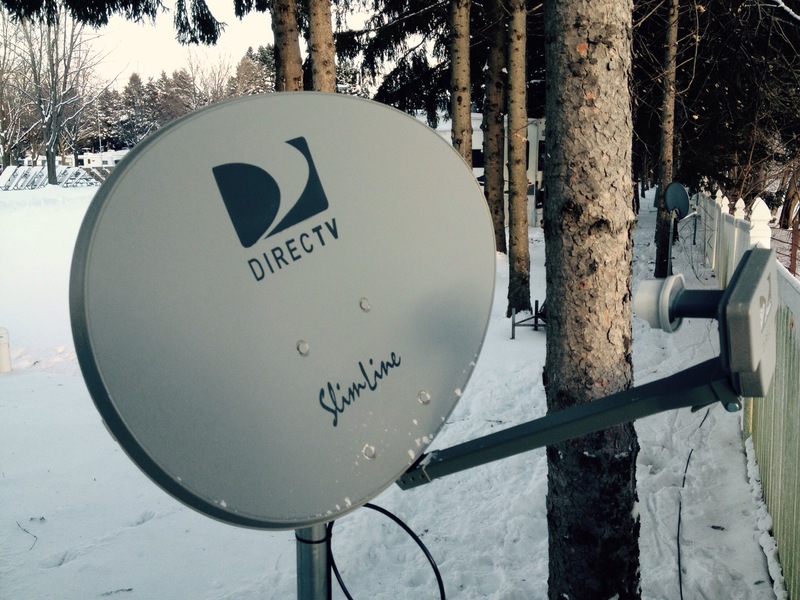 Of all days to have our satellite TV installed! So the first task at hand this morning was to shovel out the parking area and clean off Diana’s Escape, so she could get over to her mom’s place to take care of her needs. I also wanted to make sure there was room for the installer to pull in. I am a tad O/C when it comes to shoveling, as I like to make sure there aren’t any straggler piles left behind. My Fitbit Flex let me know that fact when it announced to me that I had achieved 10,000 steps without my normal 4 mile walk at the YMCA. With that sunshine, it was not too tough of a chore. 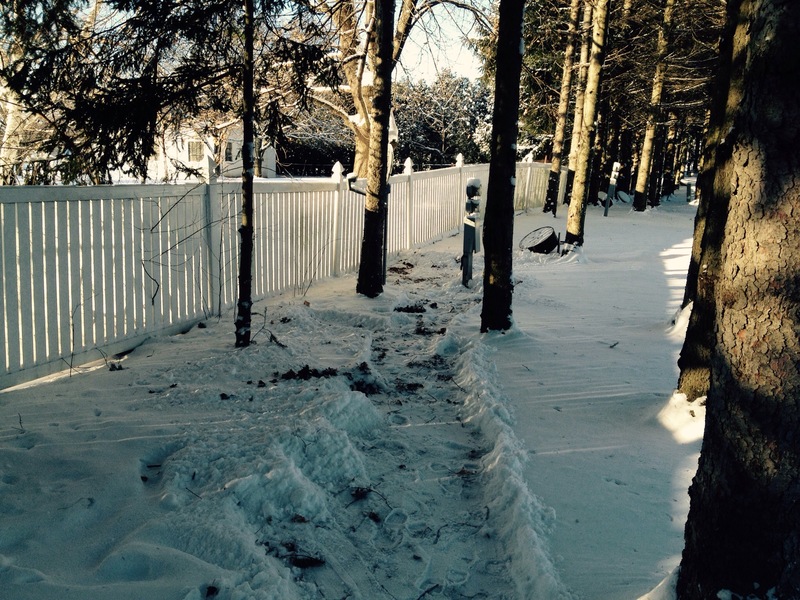 I did make sure to shovel a path to the fence row, as I knew the installer was going to have to find a clear shot at the satellite. Most of the row is covered with trees, but he did manage to find one spot. By late afternoon, we were good to go! The pole is a temporary setup, as we will have to get a tripod to make our dish truly portable. It is good to have a nice, clear HD picture again. Thank you to Gilbert for a great installation experience. With the temperatures getting into the single digits, we were finally putting our winter preparations to the test. Our first surprise came the other night when Diana turned on the faucet to find that we didn’t have any water. 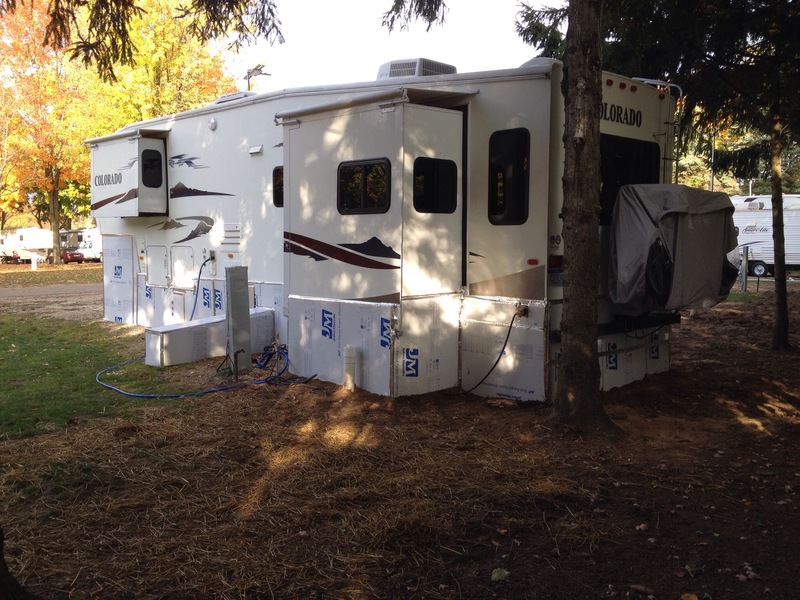 This was truly a surprise, as the campground had installed new heated faucets in the fall, and we had invested in a heated hose that was rated to 40 below. The culprit ended up being the cheap pressure regulator that we had been using. Once I removed it, we were back in business. Our campground’s water pressure is reasonable, so we feel comfortable running without the regulator for now. As you can see, the hose melts the snow around it and has performed as advertised. 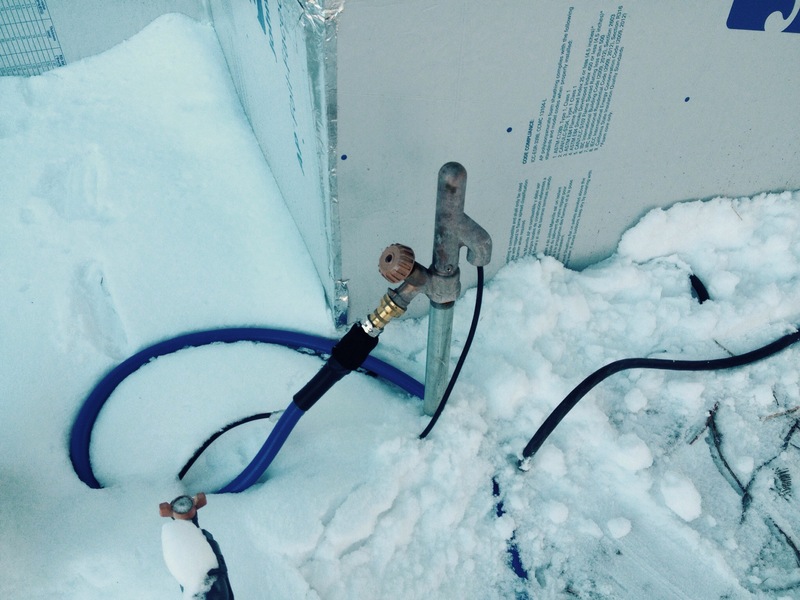 Richard’s investment in the heated faucets has also provided our row with trouble-free service. 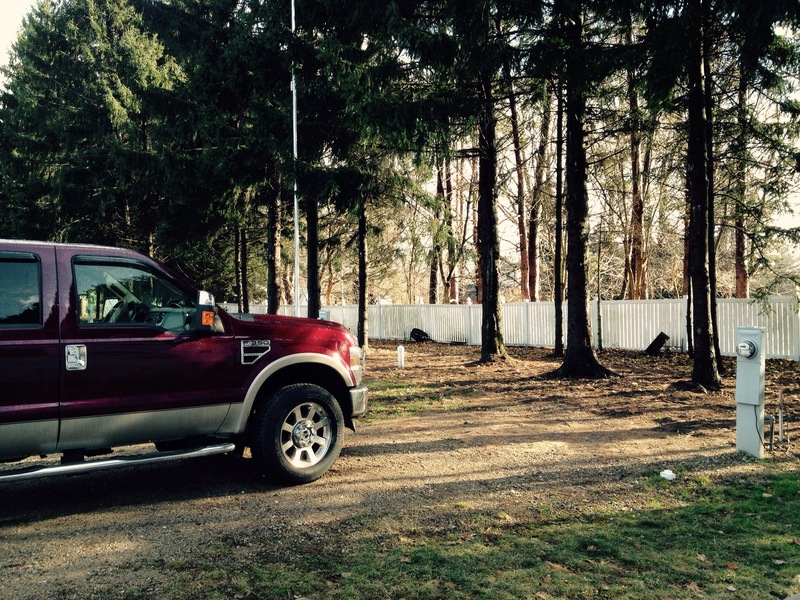 Again, our gratitude for his efforts and the service he provides in keeping Woodchip open in the winter. Our temperature under the rig at noon was 41 degrees. We are running the electric heater under there, resulting in a slightly higher electric bill. We feel that expenditure to be cheap insurance against frozen waste tanks. Our interior humidity issues have improved dramatically. In the fall, we had purchased an EvaDry Petite humidifier and a larger EvaDry dehumidifier. The bigger unit’s transformer became extremely warm, and we ended up not using it. Dissatisfied, we sent it back to Amazon and purchased a second Petite. Once that was in place, our humidity levels dropped immediately. We also have keep the bathroom window and vent cracked open, as was recommended to us by Glyn Carson at the RV-Dreams rally. We can’t explain why it works, as it seems to defy all logic…but it does. So, with our TV up and running and our daily tasks behind us, we decided to celebrate! One of our favorite spots to go for a special night out has always been the Carrabba’s in Grandville, MIchigan. Granted, Carrabba’s is part of a chain, but they are consistantly good…no matter what town we find ourselves in. They also do a great job of taking my gluten allergy into account, and they have one of the better gluten free menus available. 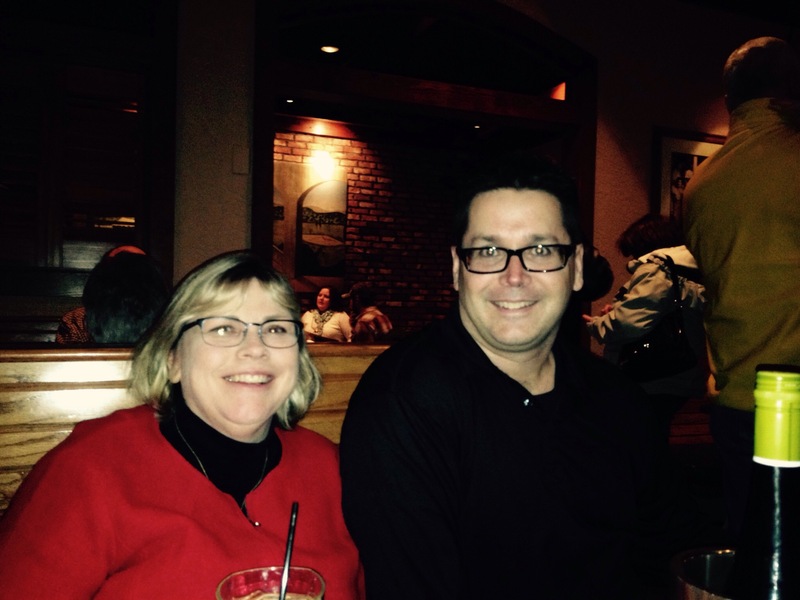 The Grandville Carrabba’s has something that no other one has: Bob; seen here with Diana. We always call ahead to see if he is working and request him to be our server. He is head and shoulders above any waiter we have ever had serve us, and we have been to a lot of restaurants during our working years. Bob is a recommendation we feel rock solid in making, short of the fact we feel we are letting our little secret out. So, what could have been a mundane Wednesday, ended up being a pretty nice day. We were able to spend a great afternoon and evening together, and we managed to complete our entertainment system in our rig. It ended up being a little sweeter, given the fact it all took place on the coldest day of the winter so far! Stay healthy for the holidays! I’m just gonna shake, shake, shake…shake it off, shake it off! Taylor, how I wish I could! It is flu season, and I speak from first-hand experience. On Saturday, I went to do my morning 4 mile walk on the track at the YMCA. For the record, I am over 6 feet tall, and a very swift walker. To my surprise that morning, people I normally pass were lapping me repeatedly. My joints ached, but that’s not out of the ordinary for my 56 year old body. By late afternoon, the flu hit me like an NFL tackle, even though I did get my flu shot earlier this fall. My first concern was to not get Diana sick, as she needs to be healthy for her mom. She remembered Tamiflu…the wonderful antiviral drug…and told me to call the on-call doctor. Long story short, I called, Diana picked it up (last available dose in the area), and it was in my system before 7 PM. I am here to tell you: this stuff works. While I am still laying low, Tamiflu took the edge off of the virus and I avoided most of the ugly side of the flu. I highly recommend it. Also, if you haven’t done so yet, get your flu shot. It supposedly lessens the effects of this mutant strain of the virus. Better yet, be sure to wash your hands often, and keep your fingers away from your face. That’s my Dr. Jim heath alert for this winter. 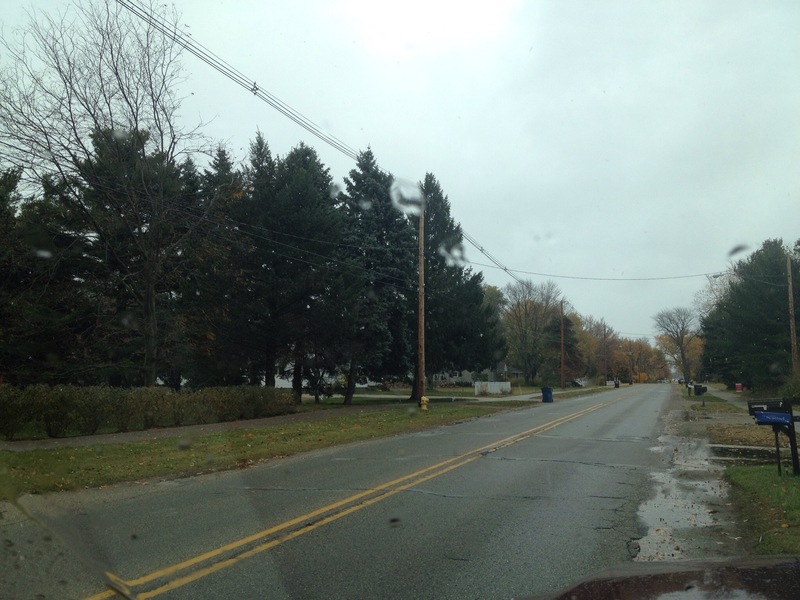 On a brighter note: When was the last time you saw a December 23rd like this in West Michigan? Yes, that is the sun! The temperature managed to work its way up to 50 degrees, which was a real treat! Granted, I wasn’t able to stay out long and enjoy it, but the few minutes I did were cherished. 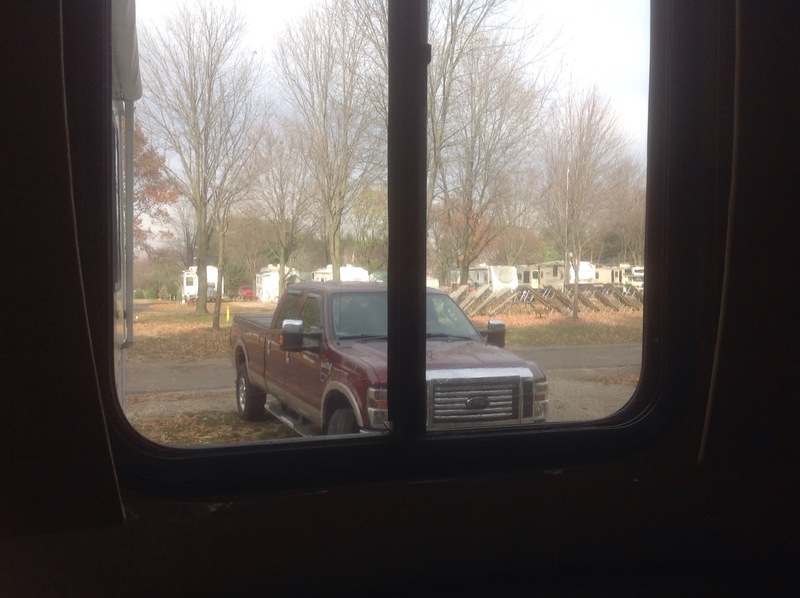 Those of you who have seen our fifth wheel know we have a lot of windows. We were fortunate to get a site this winter that points most of our windows to the south, thereby taking full advantage of the little bit of sun that West Michigan offers up this time of year. As Diana says: “Another no-shovel day!” We will take every one we can get this year. We do have our snowshoes handy, though…as winter will certainly bring us a nice layer of fluffy snow. We will be sure to post our experiences. So, as we pause to enjoy the holiday season, remember to keep good health in mind. Diana and I wish our best to each and every one of you! It’s Not The (Lack Of) Heat…It’s The Humidity! In that case, Mr. Edison would probably find our RV to be pretty smart! Grand Rapids picked up more snow in a 24 hour period than it did at any point during last season’s record setting winter. 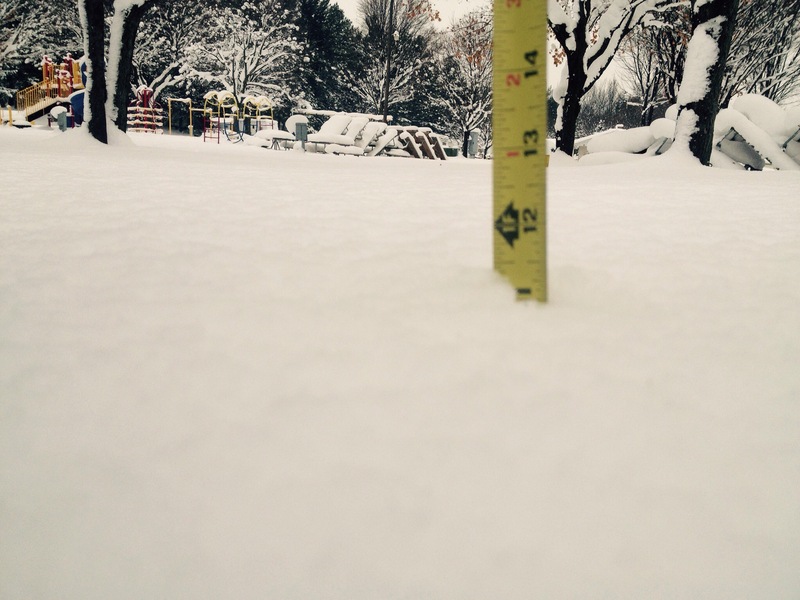 We are up to 23.4 inches of snow for November, which is the fourth highest snowfall total on record. The last 7 day’s temperatures have been 15 degrees below average. And thanks to Lake Michigan, we have only had 7% of possible sunshine. As stated before, we have been concerned about moisture buildup inside the rig. Propane heat naturally gives off water as a byproduct, as does breathing, showering, cooking and excess snow coming in from outside on our boots after shoveling. 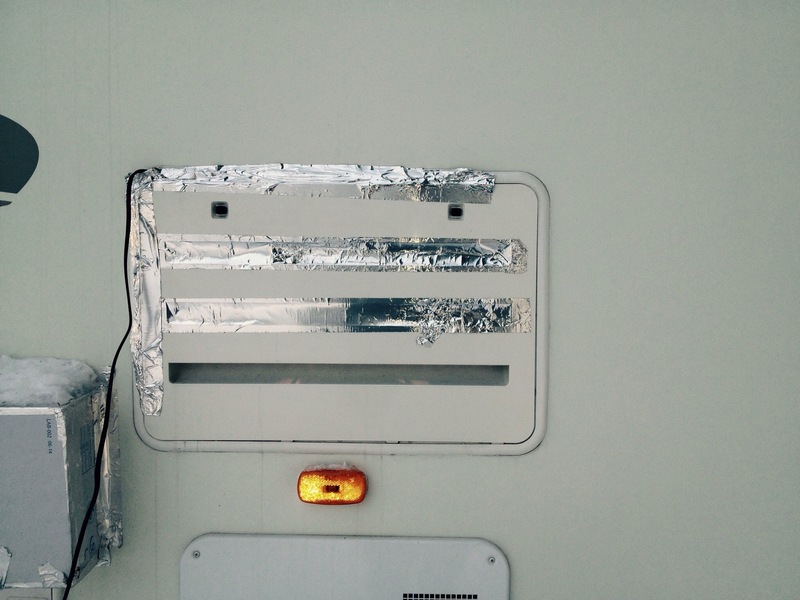 The result becomes apparent in two places: the corners of the RV and the aluminum window frames. We have found that drying the window frames off with paper towels in the morning and evening helps a lot. The day/night shades trap a lot of moisture during the night, and a quick wipe with a piece of Bounty eliminates that. Once the shades are open in the morning, the air movement from our ceiling fan keeps them fairly dry, though not 100% moisture free. The daily maintenance prevents mildew and water running down the walls. 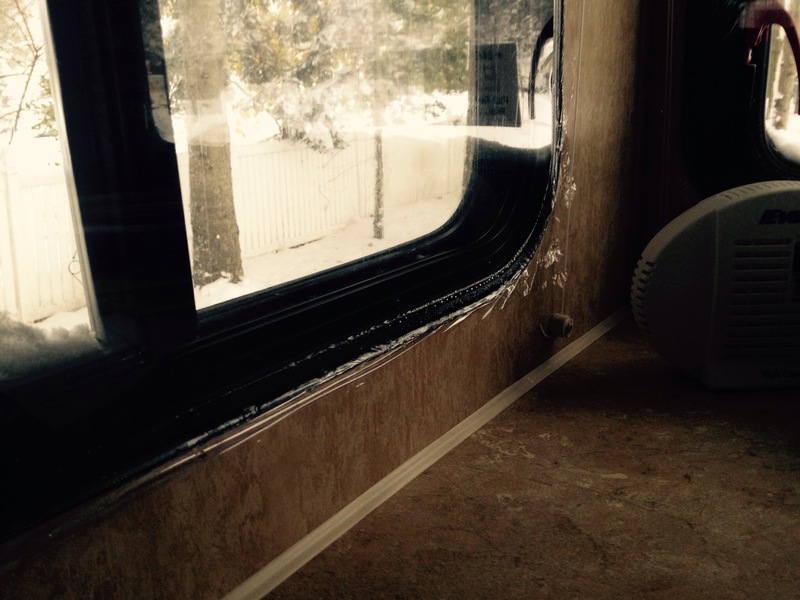 The corners of the RV have also been places that dampness builds up, especially inside cabinets. This doesn’t seem to be as bad as the windows, but it still does require daily attention. We are keeping those cabinet doors open and doing our best to point fans at the problem areas. The Eva Dry 500 dehumidifiers we put in the cabinets seem to be helping with that. We also just purchased an Eva Dry 2200 dehumidifier for the bedroom area to compliment the Eva Dry 1100 we have in the living room, so we will see how that helps the overall picture. One other thing that is working well is the fact we are taking our showers at the YMCA every day. That not only cuts down on the humidity, but also eliminates the need to run the power vent, thereby keeping the heat inside. Working out at the Y also keeps us in shape, both physically and mentally. 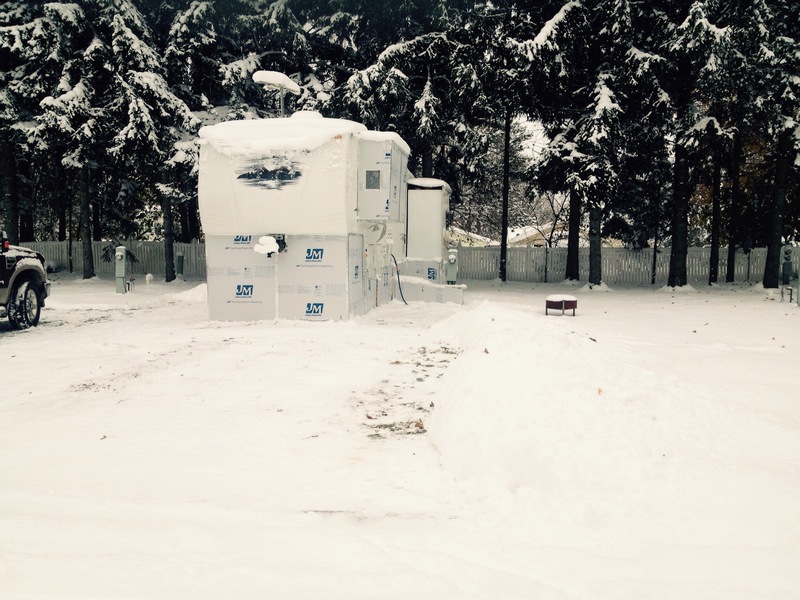 In addition, we are able to run two electric space heaters on ‘low’, which not only provides dry heat, but it cuts down on the propane bill. We are filling a 30 pound propane tank every 3 to 4 days at $25 a refill, and our electric bill looks like it will be around $160 for November. Keep in mind that we also kicked on the heater inside the skirted area below the rig. We have it set at 45 degrees, and our floors are staying comfortable as a result. Our estimate is that heating that area is costing us $40 a month. The skirting itself would definitely keep that area above freezing, but the floors would be cold, especially in our slide outs. We feel our comfort is worth the extra money. Following are several photos of our campsite to this point. 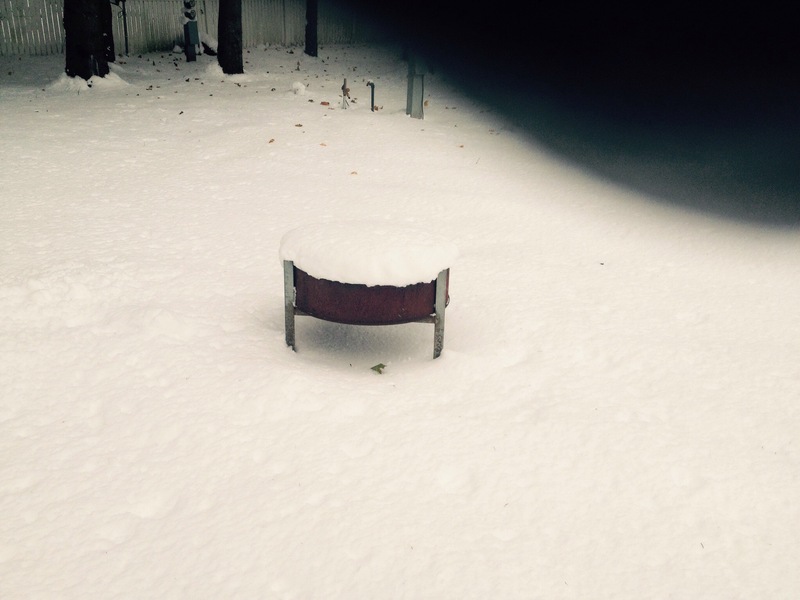 Not a lot of snow, but it is only mid November! This was taken out of our window in the middle of a lake effect snow band. At that point, the snow was coming down pretty hard. 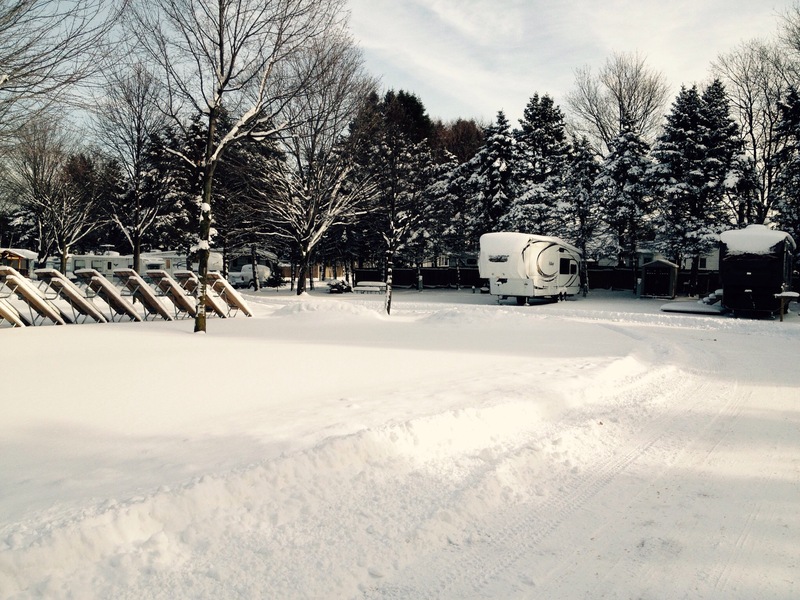 The campground has a good sized Kubota to keep the streets plowed. Keeping our campsite itself cleaned is our responsibility. The area we are keeping open is plenty wide, as we know that the snow banks will creep inward as the winter wears on. 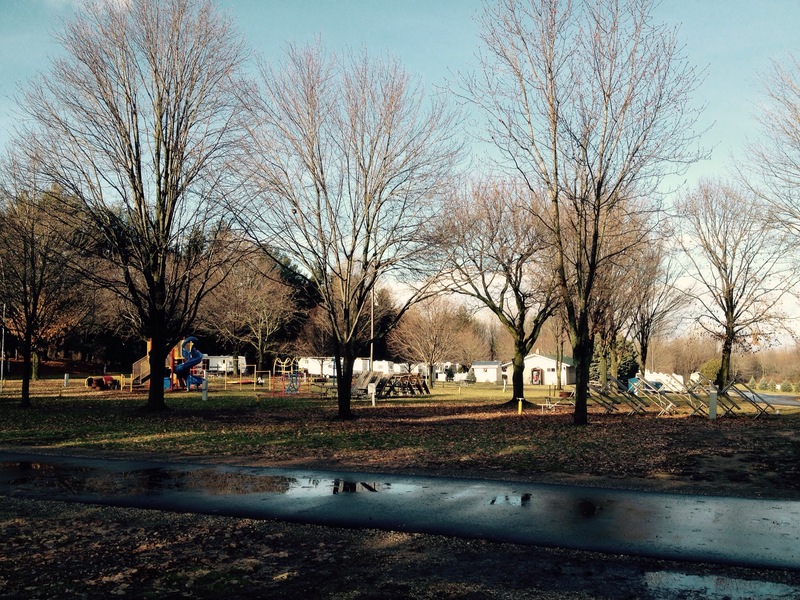 Knock on wood, the campsites on either side of us are not occupied. Hopefully they remain that way. We put partially inflated beach balls under the slide toppers. This keeps them up and will keep the excess snow and ice from pooling in them. Our Awning Airwedge is also helping, although not as much as the beach balls. Our bedroom slide sarcophagus seems to be holding up well, although it wouldn’t hurt to have the snow removed from the top of it also. All in all, this has been a positive experience for us. While the windows…even though they are double pane…have been a daily maintenance issue, we are extremely thankful our rig has so many of them. Being able to look outside prevents winter claustrophobia. The view out of our windows is beautiful. Ok, so it isn’t the Tetons or the beach at Grand Haven, but it is pretty neat nonetheless. Our winter preparations seem to have paid off, even though we were going on other’s recommendations and our own trial and error. “I have not failed. I’ve just found 10,000 ways that won’t work”. Fortunately for us, most of our efforts are working! Let the storm rage on…. From the Disney movie ‘Frozen’. 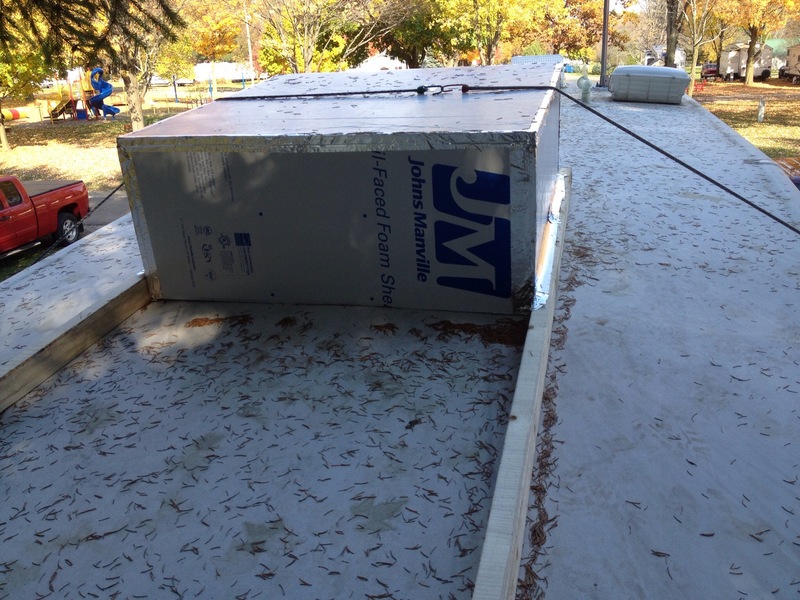 Not exactly pretty, but we encased the slide in foam sheathing. We even cut window holes into it and put some plexiglas in to allow light into the bedroom. We immediately noticed a difference. 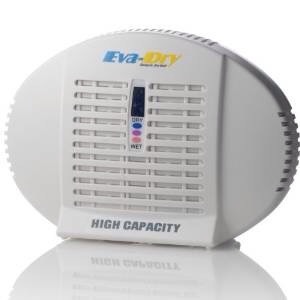 We still need a good post-modification cold snap to confirm our efforts, but we think we will be OK.
As for the cabinets, we used these rechargeable wireless dehumidifiers from EvaDry. They work especially well for cabinets. The reviews on this product are favorable, so we decided to give them a try. We will update on them in a future post. Our biggest positive so far has been the skirting. 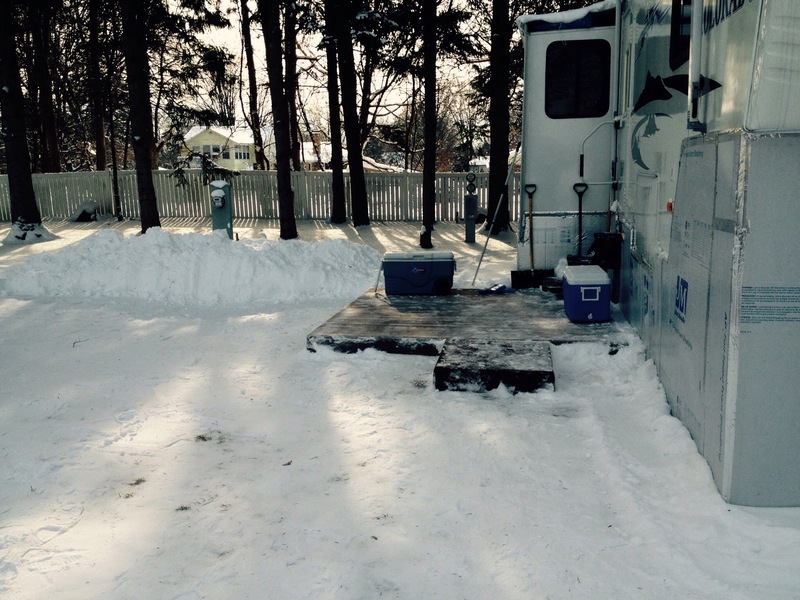 The temperature below the RV has yet to drop below 45 degrees. We have an electric heater down there ready to go, but we have not had to turn it on yet. 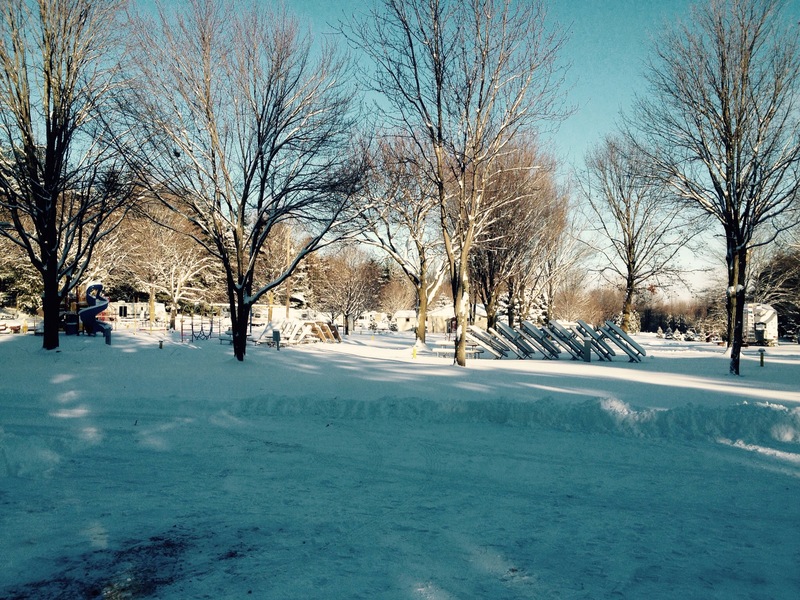 We were down to 25 degrees outside one morning, but the skirted area stayed plenty warm. In the month of October, we occupied the rig for 19 days. We used $75 worth of propane (90 pounds) and $60 in electricity. Not too bad. 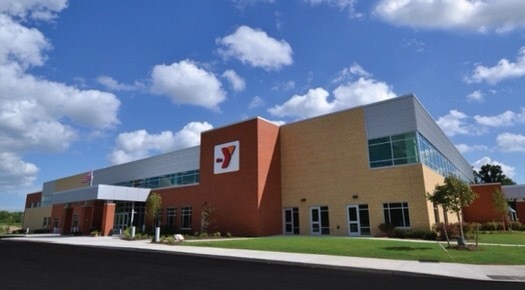 We have a membership at our local YMCA! We were going to put it on hold once we started out on the road, but decided to keep it through this winter. 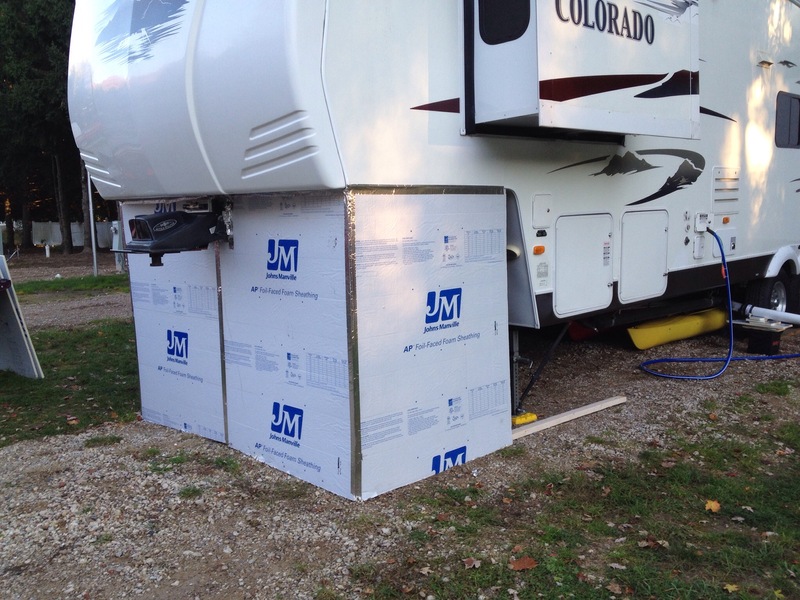 It is a nice place to get away, a great way to stay in shape, and a sure-fire way to keep the shower steam out of our fifth wheel! 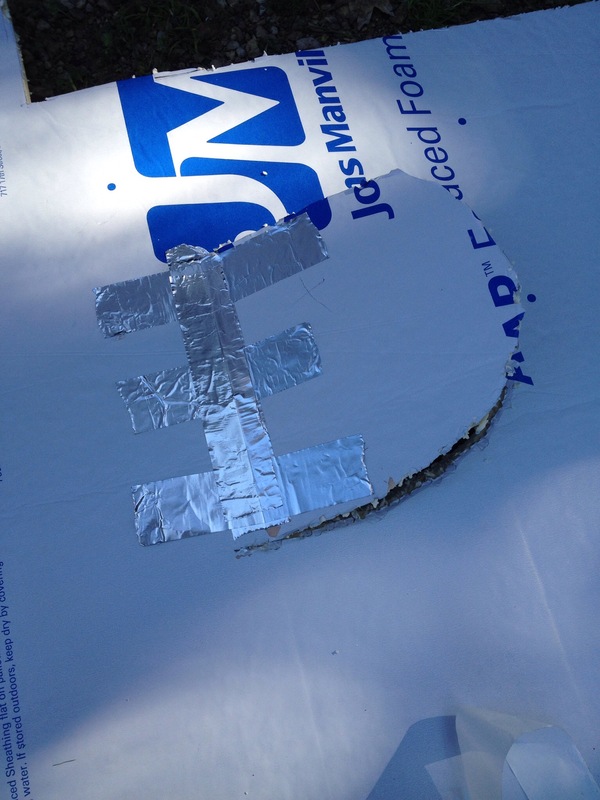 We hinged the end of the covering with silver tape and weighted the underside with a piece of wood. We will open this when dumping the tanks, so as to allow the sewer gases to escape, and not run back up under the trailer. We also have a large access door for the heater and two of our three sewer levers. The silver piece of foam flops down over the door to hold it shut. The inside connection can be seen through this door. 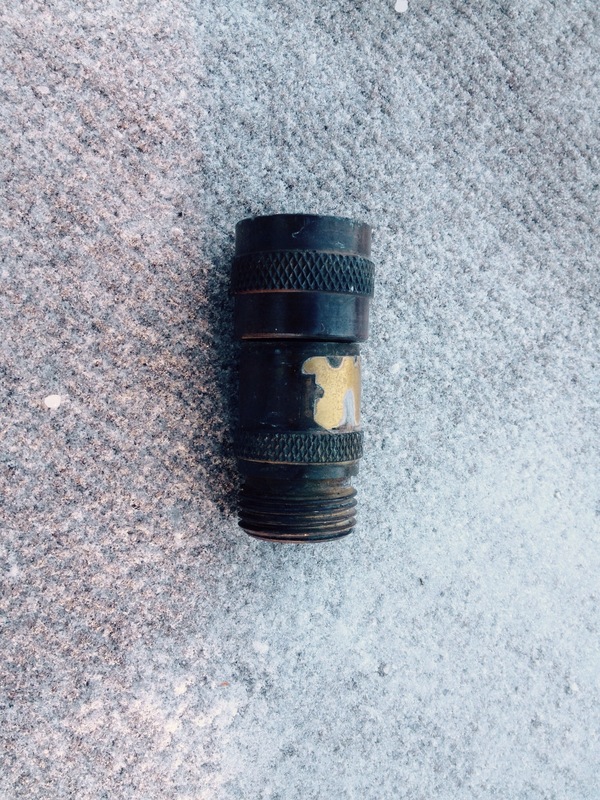 We have a clear connector on the pipe, so we can monitor the flow. Just what you want to see, right? One of our dear friends refers to the dumping process as a ‘blue job’, as it is for boys only. 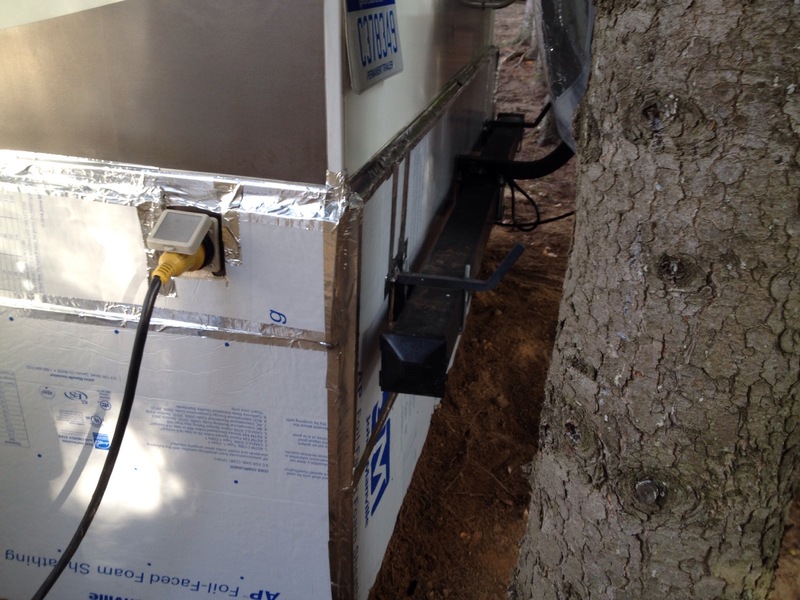 Another modification was a foam box over the air conditioner. 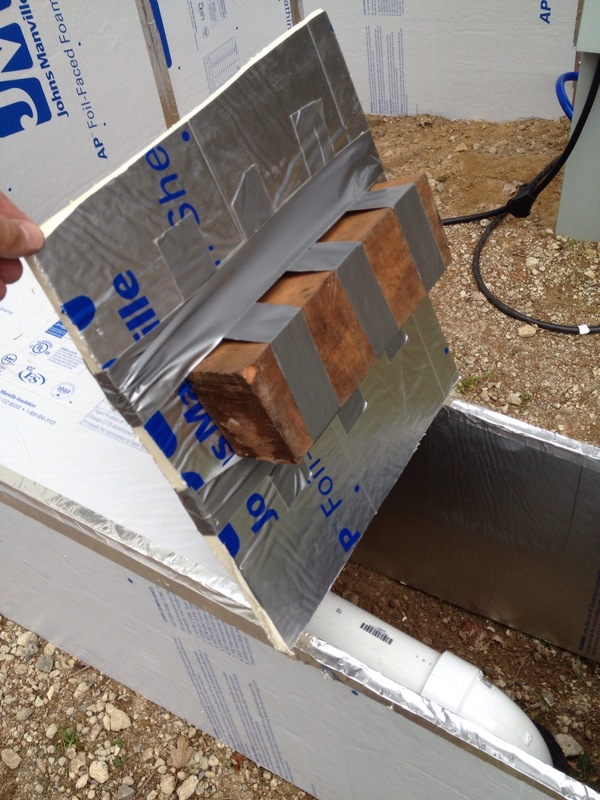 We had heard that a lot of heat is lost through an air conditioner, so we followed a few of our neighbors leads and built this. 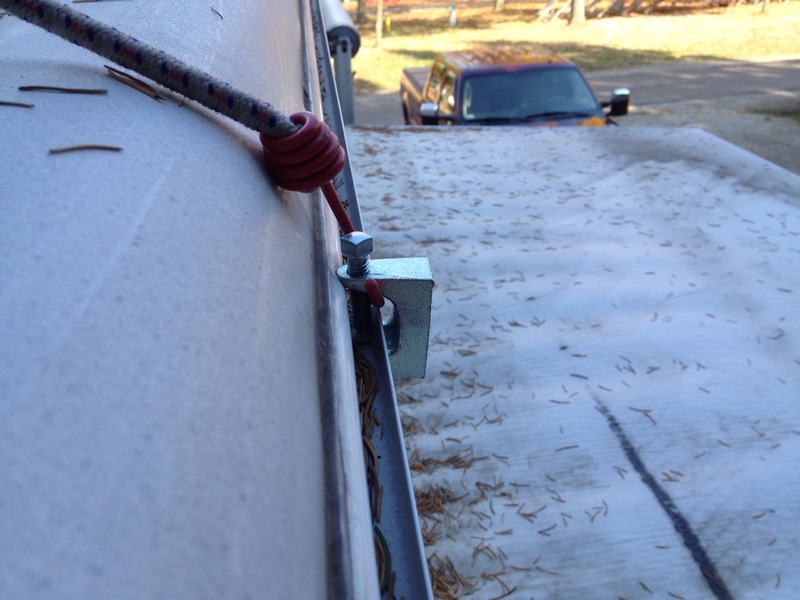 We used these small clamps from Home Depot to give us an attachment to the gutter, in order to allow us to have something to attach the bungee cord to. We found them in the electrical department. We also boxed in the fresh water connection to the RV. As you can see, we have a Pirit heated water hose. So far, it is working great! The final modification we have done is using window film on the inside of the windows. These are the plastic sheets that you tape on the window frame and use a hair dryer to make them taut. As you can see, the film still allows us to see outside quite well. Our large rear window is pointed due south, so we are looking forward to a little solar heat this winter! So there you have it! We are pretty sure we are set for the cold. Bring it on, Queen Elsa! We will post updates on how everything is holding up in future posts. Well, John…after 56 of them, I believe we are good. For the past week, the trees have been quickening their transformation into their dormant state. While still beautiful, the brilliance of the colors started to fade, and the showers of windswept leaves began to fall from the trees. The temperatures seemed to hold somewhat steady, but the weather forecasters warned us of what we were about to get hit with. 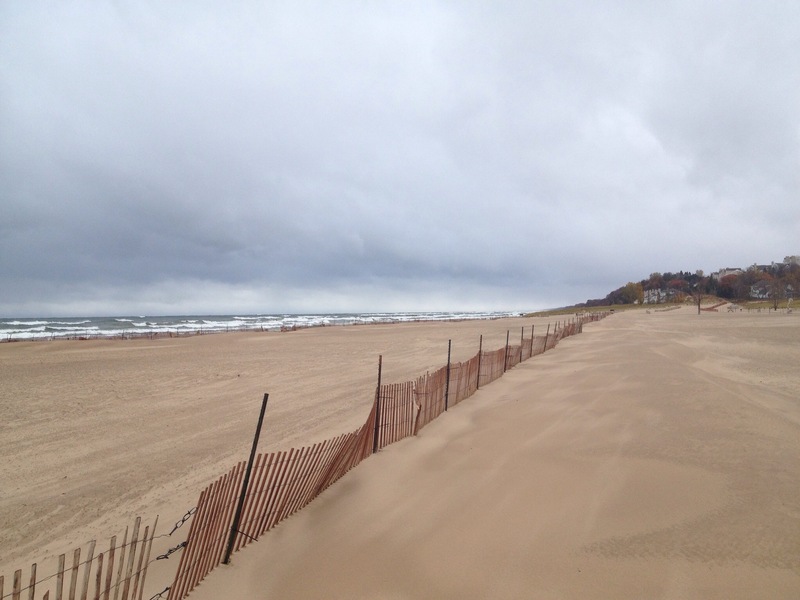 Knowing of the impending storm, we headed out to Holland State Park to view the awesome fury . 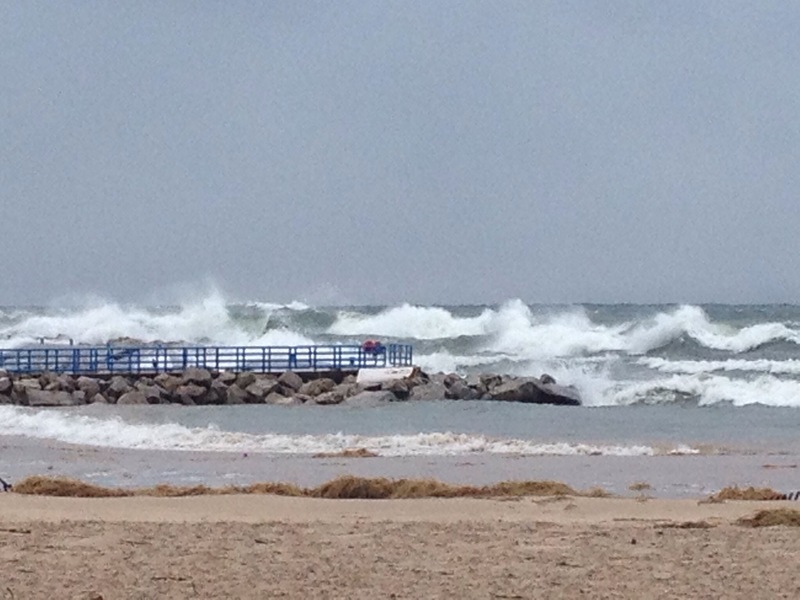 The waves were some of the largest we have ever seen, and we have been coming here since the late 70’s. This is the beach that Jim proposed to Diana on in late October of 1981, writing “Will You Marry Me?” in 10 foot tall letters in the chilly sand. As far as the eye could see, the Big Lake was reeling. Seas with 15 to 20 foot seas were predicted. Probably not a very good day to be out there in any sort of vessel. As we drove inland, the wind picked up in town. We noticed something flash across the windshield. Was it what we thought? We had to pull over to make sure. 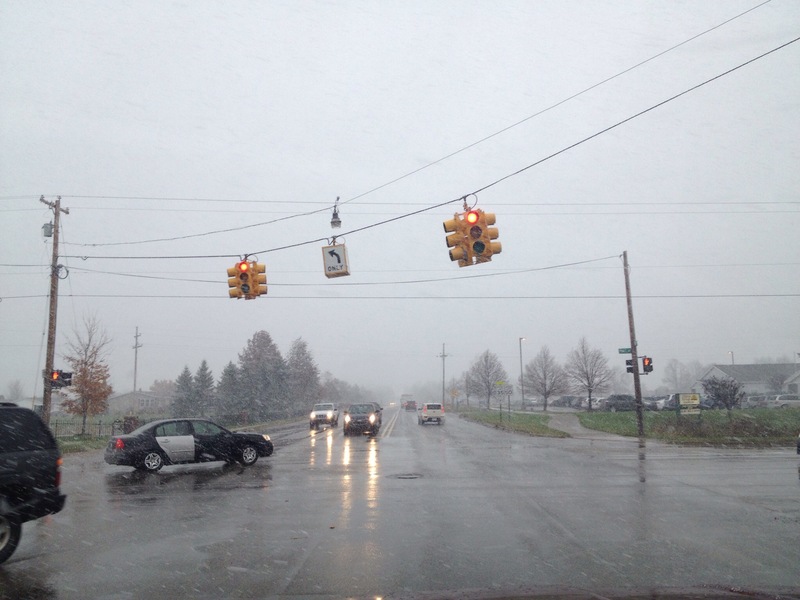 Indeed, it was the first flakes of snow to fall on West Michigan. The snow was hard to photograph, but it was there. Another mile down the road, it really cut loose. Of course, the ground is way too warm to allow it to stick, but Mother Nature was giving it her best. Before the night is over, we should have a very substantial test of our winter preparations on our rig. We are going to try out a few more modifications before posting on how we are doing. All in all, we have to say that the skirting has made a huge difference. We will post numbers when we get some lower temperatures outside. On a warmer note, we are very excited as we found out today that we have a work camping job lined up for next summer. It is in one of our favorite parks in an outstanding area in Northern Michigan. We will share more details as the time gets closer. Yes, next summer will definitely have a sweetness to it like no other! 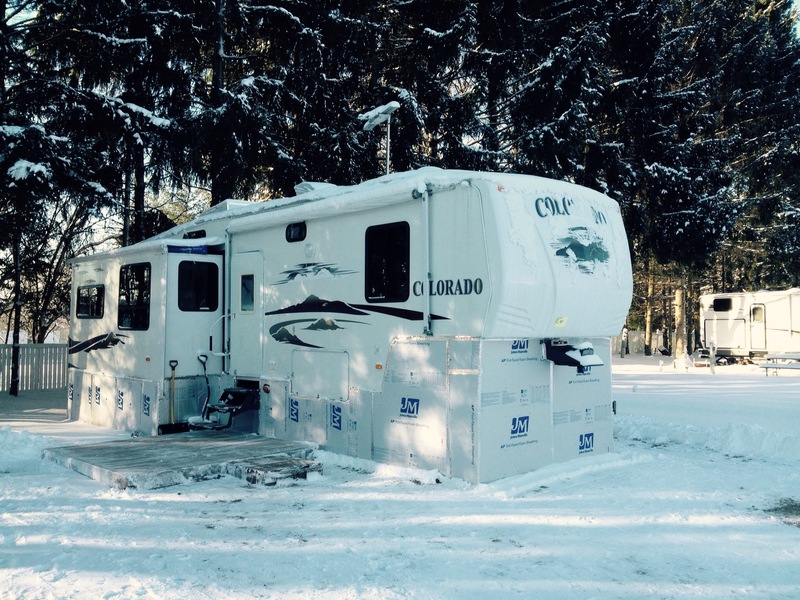 Winter weather to most full time RVers is something that they see on the TV news while sipping on an iced tea under their awning in Florida. 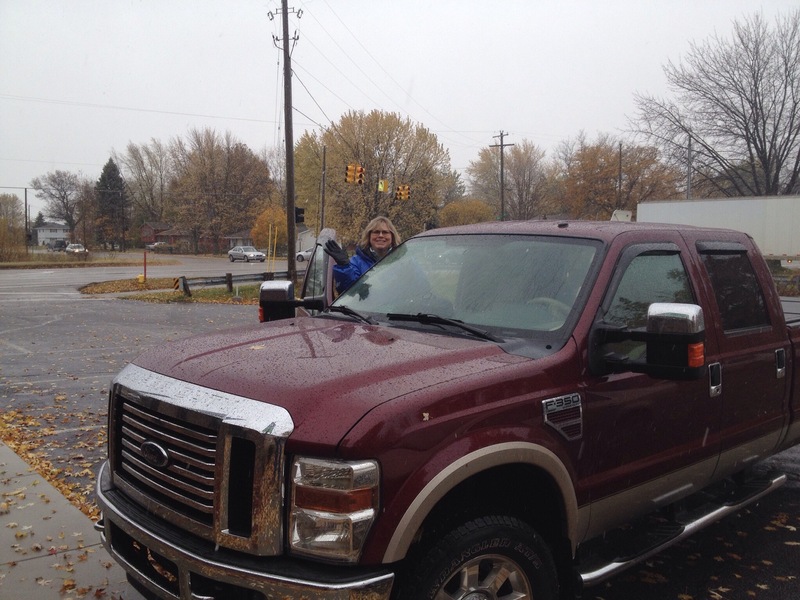 However, sometimes circumstances arise that require folks to endure a northern winter in their rigs. For us, we have been blessed with the responsibility to care for Diana’s mom, who lives a few miles from our campsite in Michigan. We are honored and privileged to accept this. 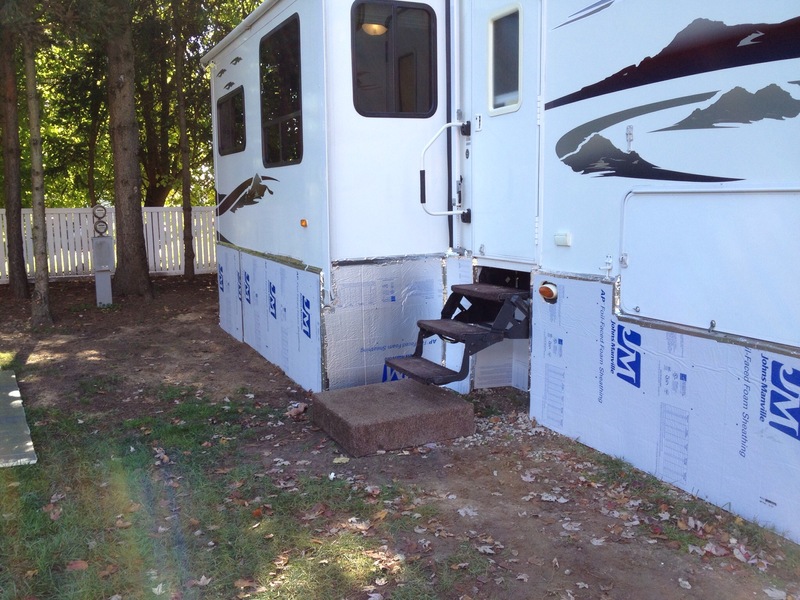 With our house sold, we had to decide whether to rent an apartment or prep the RV and make it livable for winter. We chose the latter. 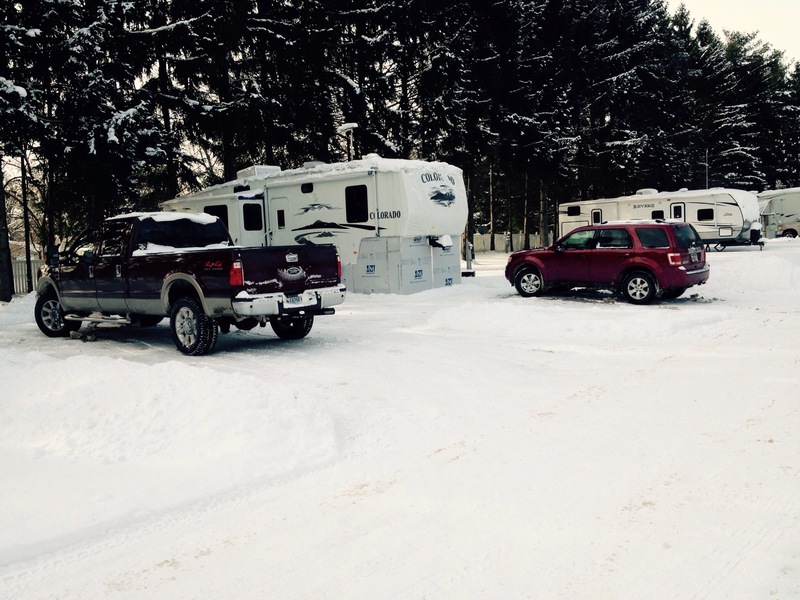 We are extremely fortunate that Woodchip Campground in Byron Center, Michigan has invested in the equipment to have 30 or so sites open all winter. Thank you, Richard! 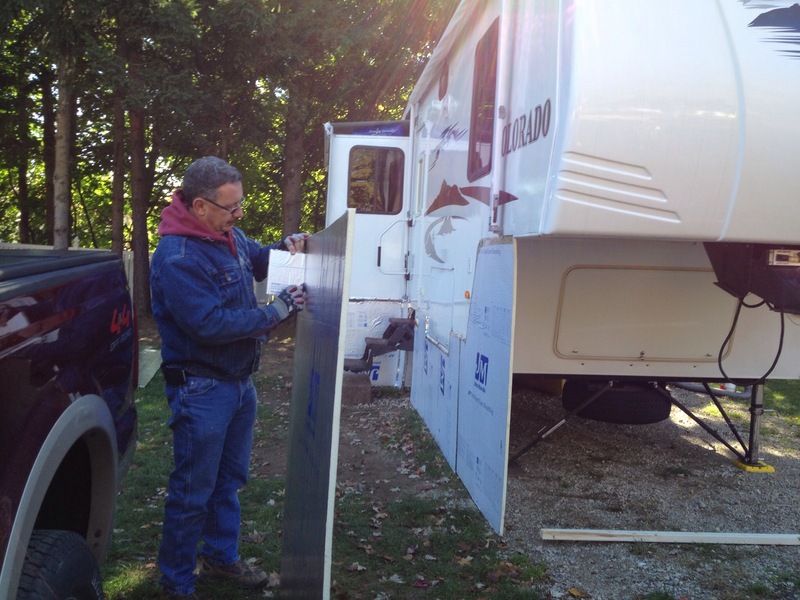 Preparing an RV for winter living requires some thought. 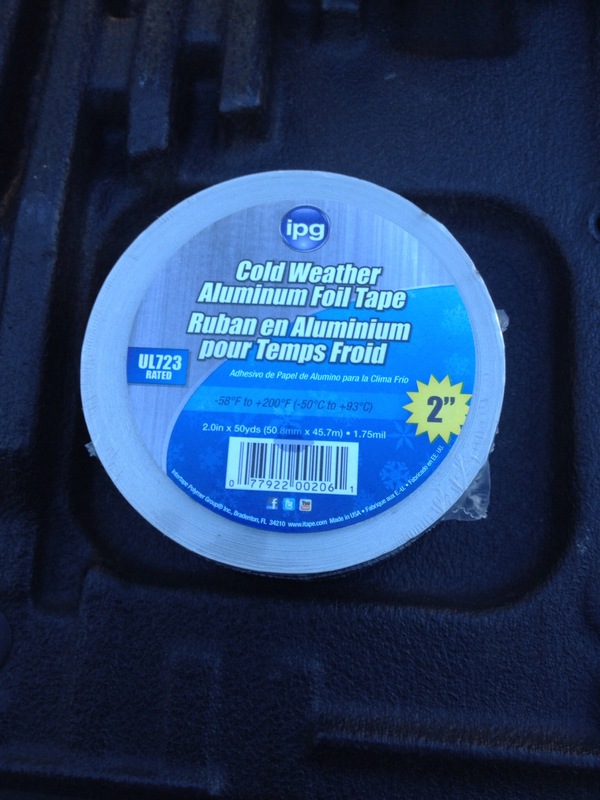 It is true that a person could put heat tape on their fresh water hose, turn up the heat and call it good. The problem with that is they would spend a small fortune in propane, and their waste tanks would most likely freeze. 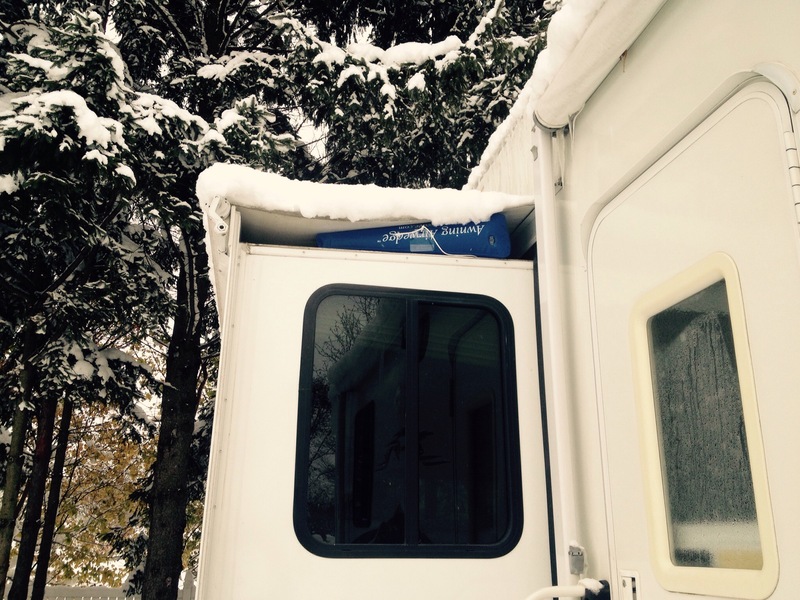 We researched several websites and spoke with people who have actually wintered in their RV’s and found out several tricks. 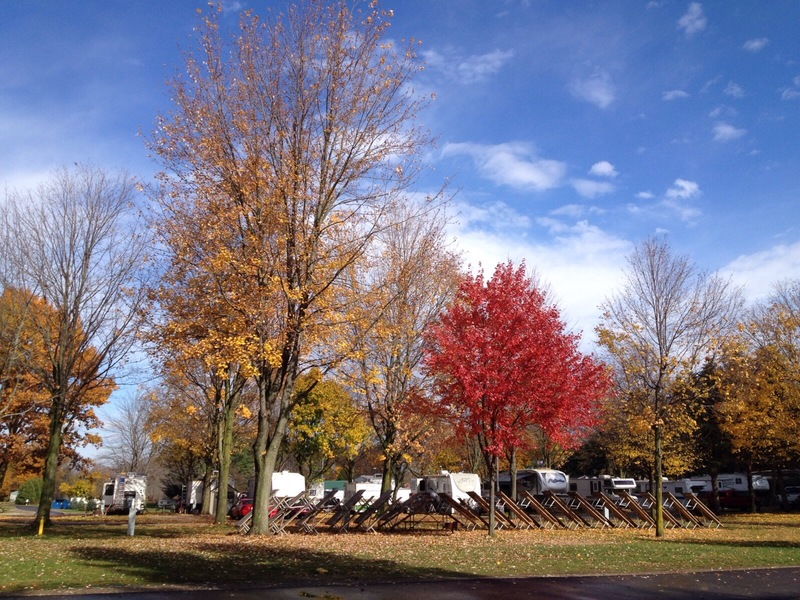 One person we spoke with at the RV-Dreams Fall Rally was Glyn Carson. He was an Ice Road Trucker in Alaska, and he lived in his RV for seven Alaskan winters. He was a wealth of information. Thank you, Glyn! Our 2007 Colorado has a “winter package”. 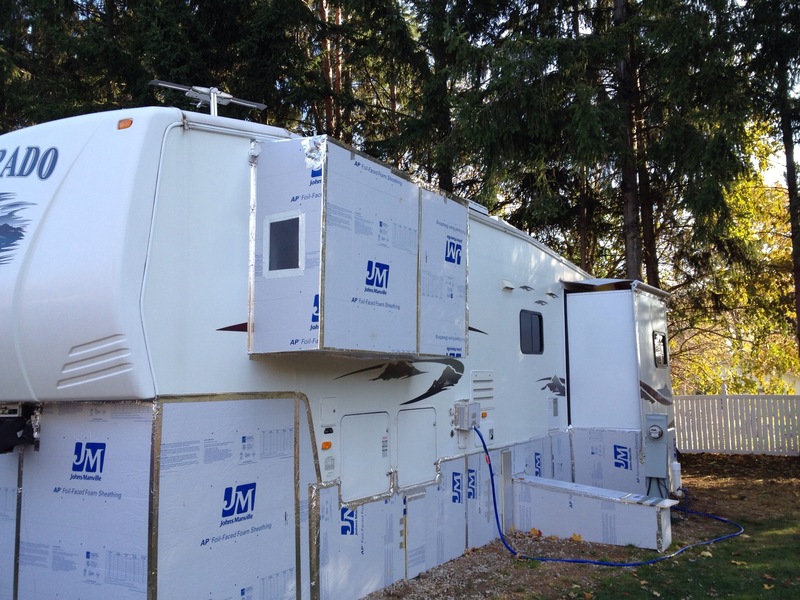 That includes a heated underbelly, heated waste tanks, and double pane windows. A couple of 30 degree mornings has proven that we need more. Our first step in the process has been to purchase 3/4″ foil foam board to skirt the rig. 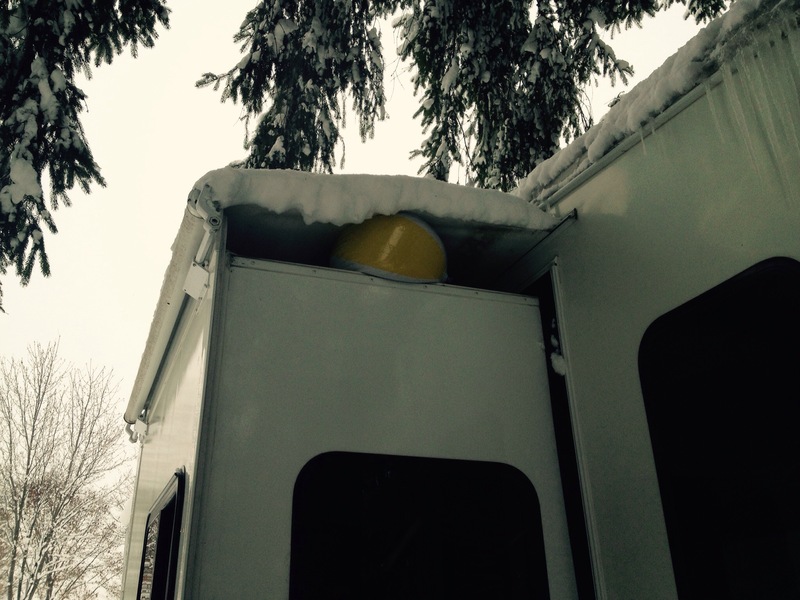 We also purchased an indoor/outdoor thermometer with a frost alarm and we placed the sending unit under the trailer. 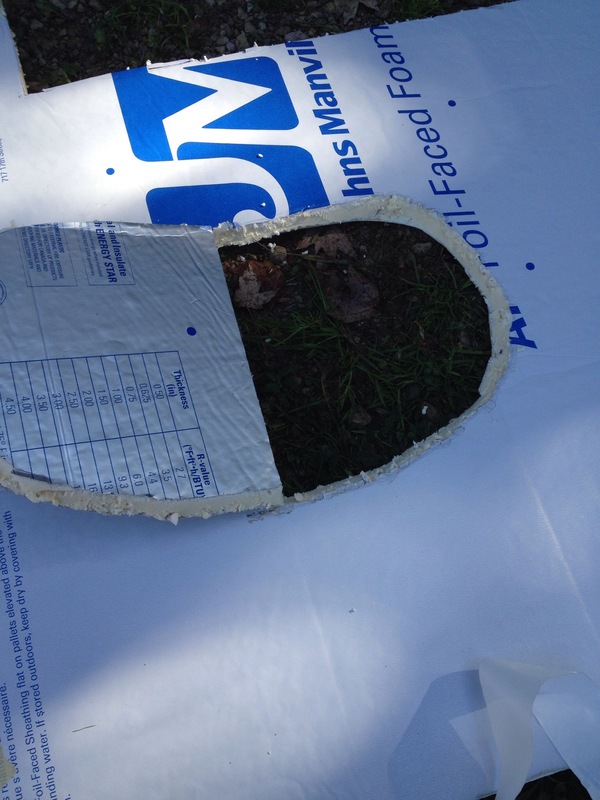 The foam panes are extremely lightweight and are easily cut with a utility knife. I used 2 x 3 lumber with long spikes driven into the ground to support the bottom of the panels. The multitude of corners also provides stability. The tape used for this is foil tape. It sticks extremely well, yet comes off without leaving residue. I applied it to the rub rail and tried to avoid sticking it to the Fiberglas gel coat. Here is a view of how the front of the rig is encased. I cut holes for the sewer levers and hinged them with foil tape. Glyn Carson said to cut them similar to the top of a pumpkin. Great tip, Glyn! Here is how I dealt with the rear bumper and power cord. This is another view of the services side of the rig. 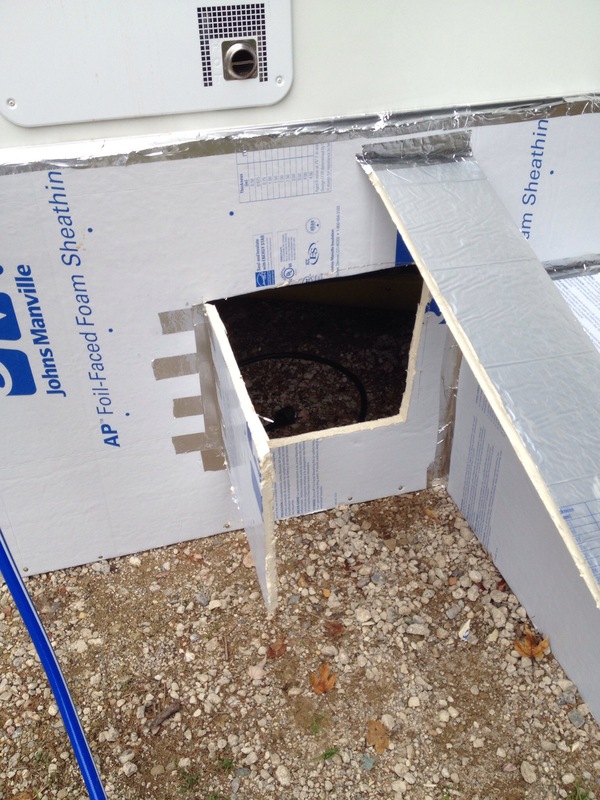 Note the box that extends from the side over the sewer. I will detail that in a later post. I also ran our spare power cord under the skirting to power a heater. We have a small oil filled electric heater coming from Home Depot. I will show that in a future post. Will we need it? Time (and our nifty thermometer) will tell. 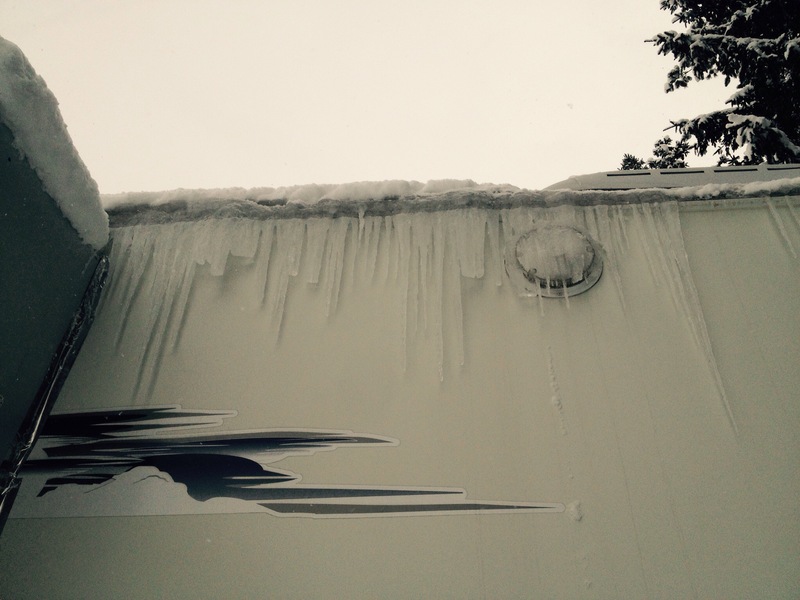 We have also discovered another issue that winter RVers have to deal with: moisture. 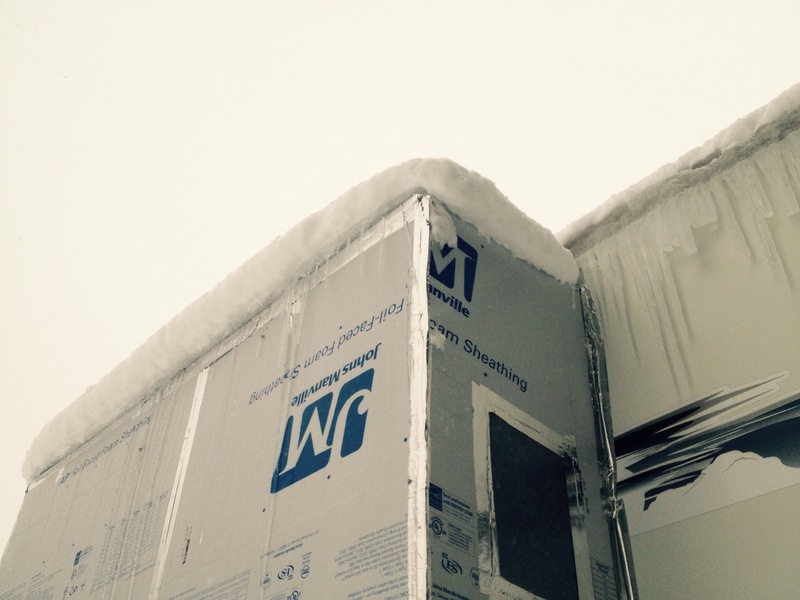 Propane heat and cooking, along with showers, generates moisture on the marginally insulated walls. Lots of folks use a dehumidifier in their rigs. I sold ours to the new homeowner, as I didn’t think we would need it. Oops. We are trying DampRid canisters instead, as we really don’t want to buy a dehumidifier. 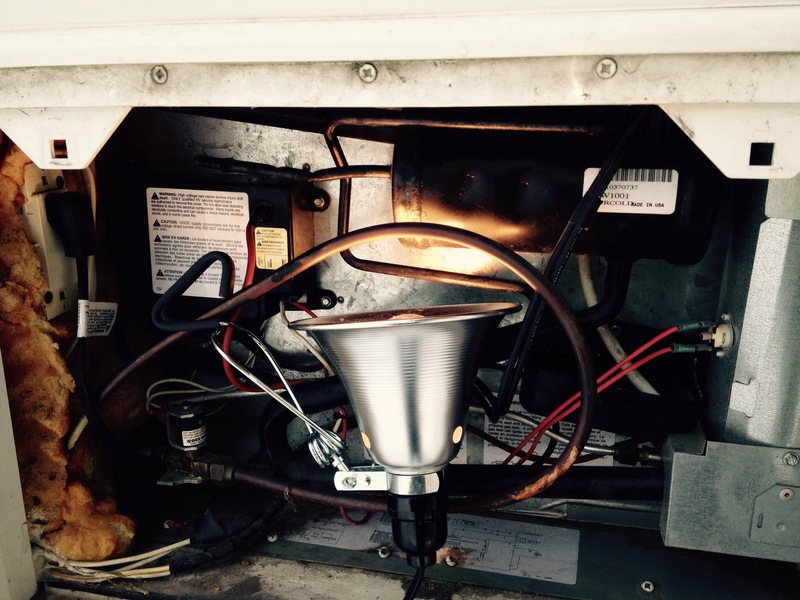 We also are going to run the exhaust fan during and after our showers. We have another issue to deal with: power, or lack thereof. We have a 30 amp service in our rig. As long as we are above freezing outside, it is much cheaper to run electric space heaters than to buy propane. It is also drier. We have an oil filled heater inside that does fine, but we can’t run two of them on 30 amps, as our outlet breaker is only 15 amps. That runs ALL our outlets. We even have to shut the one heater off when toasting our bread. So, if you are considering doing this, make sure you are in a rig with 50 amp service. 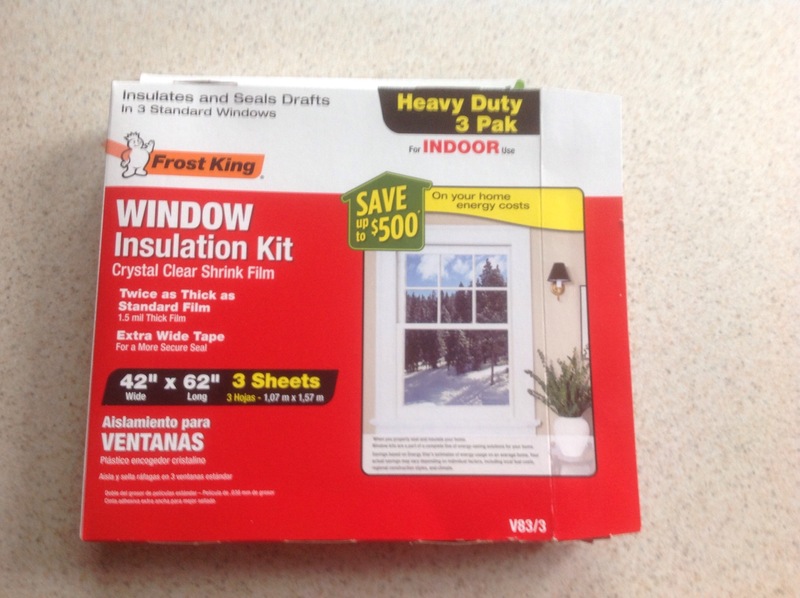 Lastly, we are using window insulating film on our windows. Yes, they are double pane, but they still radiate cold. Every little bit helps. We will post more on this subject as we move through the winter. I know a lot of you have expressed interest in what we are doing to ride this season out. We are looking at it as an adventure. Be sure to stay tuned. And if you find yourself under your awning in the tropics with a nice cold glass of iced tea, ponder the ice cube spinning in the glass. We’ll be peering out from inside!